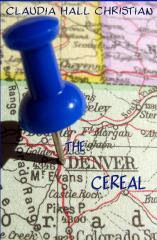 Denver Cereal by Claudia Hall Christian is a very unique book. It is serial fiction. No, this does not mean that it is about serial killers...it means the book is serial published. This book was published on the authors website one chapter at a time every week. How cool is that? You can go here to download the entire book and also the second book named Celia's Puppies. I will be reviewing Celia's Puppies in the future.